CINCINNATI — Kroger Co. announced its technology leadership succession plans in support of Restock Kroger. Christopher Hjelm, executive vice president and chief information officer, will be succeeded by Yael Cosset, Kroger’s chief digital officer, effective May 1, 2019. Hjelm will remain executive vice president, reporting to chairman and chief executive officer Rodney McMullen, until his retirement on August 1, 2019. Cosset will assume responsibility for the Kroger Technology function in addition to his current Kroger Digital portfolio – underscoring the strategic integration of digital and technology initiatives to deliver customers anything, anytime, anywhere. Hjelm joined Kroger as senior vice president and chief information officer in 2005, after an extensive career in technology, including key senior executive roles at FedEx, Orbitz, and eBay. He was promoted to executive vice president in 2015. Hjelm’s passion for technology and innovation were instrumental in developing industry-leading solutions including Scan, Bag, Go, ClickList, QueVision – Kroger’s technology solution to speed up checkout wait times, and most recently the company’s digital EDGE Shelf technology. Cosset was elected group vice president and chief digital officer in January 2017, where he has been successfully leading Kroger’s digital growth strategy. He previously served as chief commercial officer and chief information officer of 84.51° since its inception in 2015. Prior to this, he held several leadership roles at dunnhumby, including executive vice president of consumer markets, global chief information officer, and chief executive officer of KSS Retail, a global enterprise software provider of price modeling and optimization solutions for retailers worldwide. Originally from France, Cosset graduated from the Classes Preparatoires aux Grandes Ecoles (Lycee Camille Guerin – Poitiers, France) with a major in Mathematics, and earned a Master of Science from the Business School of the Ecole Superieure de Commerce de Chambery (INSEEC – Chambery, France). Lastly, the company named Stuart Aitken to the newly-created role of senior vice president, Alternative Business, effective February 3, 2019. 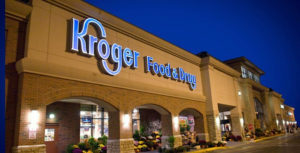 In this role, Aitken will assume oversight for Kroger’s successful existing alternative profit businesses, including 84.51° and Kroger Personal Finance (KPF), and also lead the development of a full portfolio of alternative businesses to support the transformation of Kroger’s growth model. Mr. Aitken will continue to serve as chief executive officer of 84.51° and oversee Kroger’s marketing function. Aitken was elected group vice president in 2015 and has been responsible for leading Kroger’s data analytics subsidiary, 84.51°, as its chief executive officer since its inception, also in 2015. In addition, Mr. Aitken has been helping transform Kroger’s marketing efforts as chief marketing officer since 2017. Prior to this, he served as the chief executive officer of dunnhumbyUSA since 2010. Mr. Aitken has over 15 years of marketing, academic and technical experience across a variety of industries, and held various leadership roles with other companies, including Michael’s Stores and Safeway, Inc.